Superior position in itself does not constitute an aggravating factor, true. But abuse of a position of influence and authority on Al-Badar force and it’s headquarter can be legitimately taken into account as an aggravating factor in awarding sentence. Additionally, the manner in which the accused exercised his position of authority on Al-Badar men, the principal perpetrators in executing the planned and designed mass killing of intellecrtuals can justify a finding of accused’s substantial position of authority as an aggravating circumstance. The authority the accused Ali Ahsan Muhammad Mujahid therefore exercised over the Al-Badar men and their headquarter which was known as ‘torture camp’, and his active role in encouraging them to liquidate the pro-liberation Bangali civilians terming them ‘miscreants’, ‘agents of India’ are indeed aggravating factors. 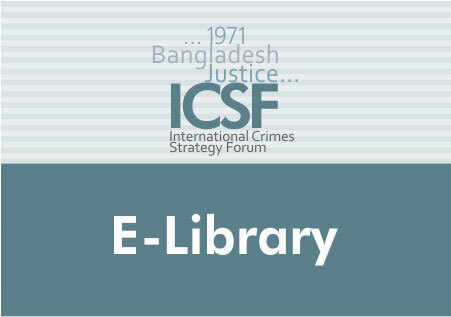 Therefore, accused’s ‘superior position’ or ‘position of authority’ on infamous Al-Badar force and it’s headquarter at Dhaka city [as listed in charge no.6] and his mode of participation in committing the crimes [as listed in charge nos. 7] justifiably increase his culpability which deserves to be taken into account as tangible ‘aggravating factor’. In view of above discussion , the Tribunal is of the unanimous view that there would be failure of justice in case ‘capital punishment’ is not awarded for the crimes, as listed in charge nos. 6 and 7 as the same indubitably falls within the kind of such gravest crimes which tremble the collective conscience of mankind. As such, justice would be met if for the crimes as listed in charge nos. 6 and 7 the accused Ali Ahsan Muhammad Mujahid Muhammad who has been found guilty beyond reasonable doubt is condemned to a ‘single sentence of death’ under section 20(2) of the Act of 1973.